A project manager’s job is to coordinate a project and make sure that regulations are met, that everyone has a job and that deadlines are met. If you want to look at being a successful project manager there are several jobs you need to do. During your time managing project you will need to hire a contractor to help you deal with the running of the project, creation of safety regulations and to ensure productive working during the working week. Once you have chosen the right contractor for the job it is time for you to get started on the project. A construction project is a large scale and time consuming process, and although there are differences in every project, the basic outline is the same for every project. The first phase of any project is the time where you discuss your intentions for a project and decide whether or not it is feasible for you to carry out the project as the client has outlined. This is the part of your process which will tell you whether or not the project is a risk worth taking for the business, and how it will be done. Once you have discussed the project with your team you will be able to agree upon the conditions of the project and write up a document known as a PID. A project initiation document states that you are all happy with the project to go ahead, and opens the door for you to progress onto the next stage. Once the PID has been signed and handed in, you can move onto the next stage of the project which involves planning out everything you are going to do. The main three things you will be planning during this phase of the project are the timescale, cost and resources. It is incredibly important to set yourself a strict budget for your project because this will allow you to start researching your supplies and resources, and haggling for the best deals you can on building materials. Once you have a budget to work with you have a goal for the cost and it will make things much easier for you in the long run. You can then look at the amount of work which needs to be done, break it down into stages and come up with an estimated timeline. This doesn’t have to be completely accurate, it will simply provide you with a guideline and help you as you work on the project later on. Things will always happen on a project which can slow work down. It could be an injury, some planning issues or even a spot of rain. Be flexible with your timeline and set yourself some extra time to complete the work. Once the project has been decided upon and planned, it is time to get to work and actually complete the work. 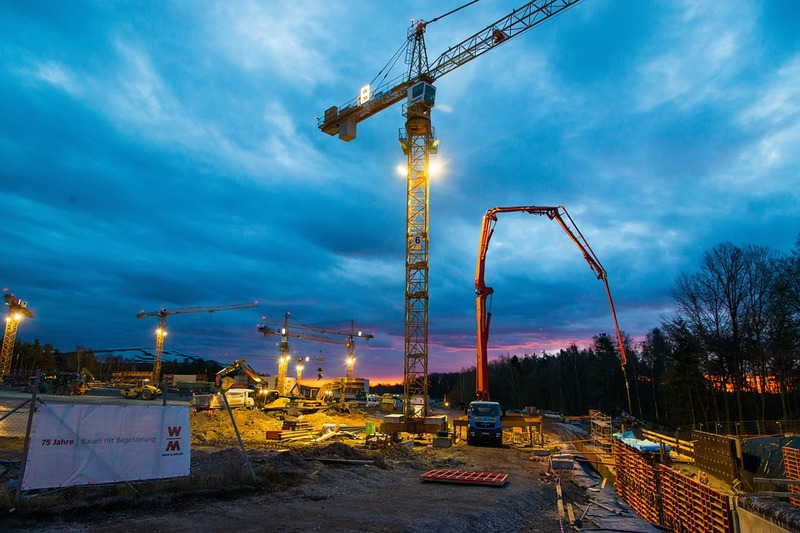 This part of the job will involve things such as sourcing a rough terrain crane for sale and other heavy lifting equipment, making sure that your employees all have a job delegated to them, and making sure that the work is carried out safely. Health and safety is a crucial part of your job here, and it will serve you well to go through health and safety rules extensively with your workers and ensure that everyone is trained sufficiently. Take the time to train some of the workers as first aiders just in case anything ever happens on site and you aren’t there. Every part of this project needs to be monitored meticulously and controlled to the last screw and bolt. Once the work is completed and the project is done, you will need to take an extensive look around the area and make sure that the project is completed to the highest standards and ensure that everything is safe. Take the time to evaluate the success of the project and jot down any issues you faced along the way, as well as how you coped with each issue as it arose. This will help you to assess the success of the project as a whole and make sure that you improve next time around. If you want to be able to manage the most successful project you possibly can, you will need to learn how to schedule different tasks so that everything goes as smoothly as possible on the job. The goal of scheduling is to make sure that all equipment, resources and materials reach the site at the correct time to avoid any delays in the project. This allows the work to be carried out efficiently and allows the project to go smoothly. Here are some of the ways you could schedule for a project. If you haven’t heard of a Gantt chart before, you soon will. It will become one of the most used tools in your arsenal. A Gantt chart allows you to see a complete overview of your construction project and shows you what tasks need to be done and when. As you are in the middle of a task you can mark it on the chart, and when it is completed you can show this. It helps you to get an overall view of how long each task took your team and will allow you to think of ways to improve next time if there were delays. Line of balance scheduling allows you to record repeated tasks with ease and it allows you to meet your deadlines efficiently. It is a tool which is great for making sure that tools and materials are allocated at the right time. Critical path scheduling is one of the most popular techniques for scheduling a project, and it allows you to calculate timelines accurately and make sure that everything goes to plan. It is a type of scheduling which can often contribute to the early completion of your project. As we know, defining the budget for a construction project is incredibly important and can be one of the crucial factors in making sure you manage a successful project. There are a few main areas which a project manager should think about when creating a budget for maximum success. It is crucial when you start a project that you take the time to check for what is needed and what isn’t. Analysing the different materials and resources for your project is incredibly important and should be the main thing you consider before you begin work in the site. It will allow you to decide exactly what your business needs to move forward and if there are any areas which you can save your money on. Once to know where the priorities lie in your project you will need to think about coming up with a basic cost. This won’t be a complete accurate estimate but it will act as a guideline for future and help you make decisions later on in the process according to what you can realistically afford. Whenever you work on a large construction project it is incredibly important to stick to your budget and not overspend for you business. If you overspend this can be an issue and it will make life harder for you in the long term. By monitoring every outlay during the process you can see how much you are spending and make changes accordingly. Once you have worked through all of these factors you will be able to run a successful project for your brand or business and make sure that everything goes as smoothly as possible. Working on a project can be a drawn out and complicated process but once you understand the fundamentals of managing the project you will be able to work with ease.